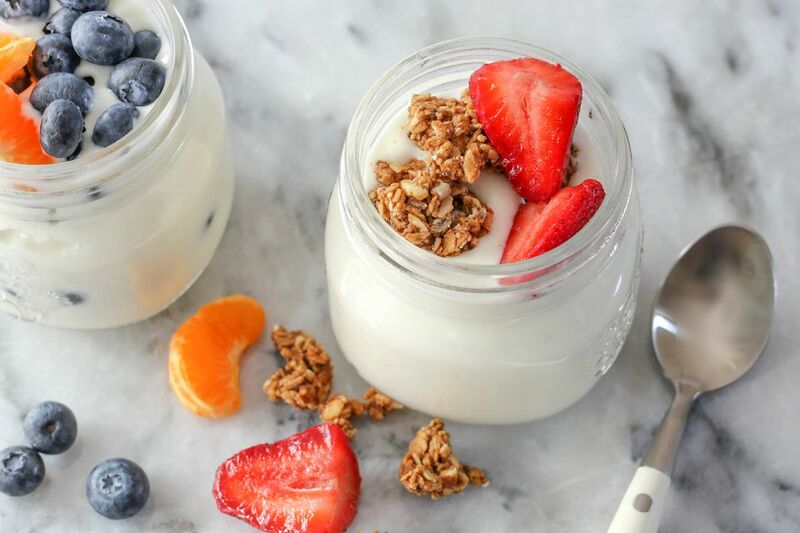 All you need to make this homemade Instant Pot yogurt is milk and a small amount of yogurt (or freeze-dried yogurt starter). The process takes time, but there's very little hands-on prep required. Make sure the yogurt you choose as a starter is plain with no added sweeteners, and it must have live active cultures. Not all commercial yogurts include live active cultures, so check the label to make sure. This homemade yogurt is delicious on its own, or you might want to add flavor when it's ready. Add some pure vanilla extract to the finished yogurt along with honey or another sweetener, or serve it with berries and crunchy bits of granola. Yogurt is acidic, making it an excellent savory marinade for many dishes, such as tandoori chicken, tikka masala, and Middle Eastern shawarma. In many cases, yogurt may be used in many recipes as a substitute for sour cream. Pour the milk into the inner pot of the Instant Pot. Lock the lid in place. There's no pressure involved, so there is no need to turn the valve—it can be in the sealing or venting position. Choose the yogurt button and press it until you see the word "boil" on the display. On earlier models, choose the yogurt button and then use the adjust button to get to the "boil" setting. This will take about 30 minutes. When the 30 minutes is up, check the temperature with a thermometer. The temperature of the milk must be at least 180 F. If it hasn't reached that temperature, use the sauté function to keep heating it until it is at least 180 F.
Remove the inner pot to a rack and let it cool to about 110 F to 115 F, about an hour. If the milk is too hot, it will kill the bacteria. For faster cooling —about 15 minutes or so—set the inner pot of milk in a large container or sink with a few inches of ice water. Put the 1/4 cup of yogurt in a small bowl and add about 1 cup of the warm milk. Whisk to blend and then whisk it into the rest of the warm milk. Put the inner pot back in the Instant Pot and place the lid on the pot (again, it doesn't matter if it is on seal or vent). Choose yogurt and adjust to the "normal" setting. Set the time for 8 hours or longer. Longer will produce a tangier yogurt. When the time is up, remove the inner pot and transfer it to the refrigerator to cool. When the yogurt has cooled, spoon it into half-pint or 1-pint jars. Store the yogurt in the refrigerator for up to 10 to 14 days. Serve yogurt with fruit, berries, nuts, or granola, or swirl some jam into it. The starter yogurt must have live cultures. Check the label to make sure. For subsequent batches, you can use your homemade yogurt as the starter. For thick, Greek-style yogurt, strain the finished yogurt through cheesecloth.